Rice University researchers have determined a more effective way to use natural gas to reduce climate-warming emissions would be in the replacement of existing coal-fired power plants and fuel-oil furnaces rather than burning it in cars and buses. The Rice study by environmental engineer Daniel Cohan and alumnus Shayak Sengupta compared the net greenhouse gas-emission savings that could be realized by replacing other fuels in vehicles, furnaces and power plants. They found that gas-fired power plants achieved the greatest reduction – more than 50 percent – in net emissions when replacing old coal-fired power plants. 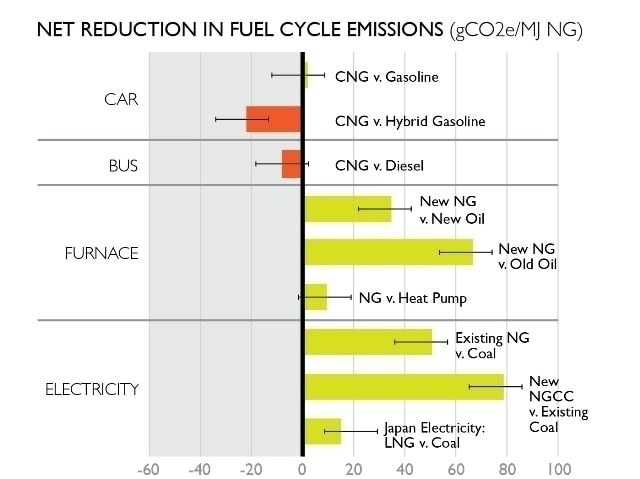 The use of compressed natural gas in vehicles yielded the least benefit, essentially matching the emissions of modern gasoline or diesel engines. The study, funded in part by Rice’s Energy and Environment Initiative, appears in the International Journal of Global Warming. The researchers’ calculations considered emissions throughout the fuel cycle, from production and transport of each fuel through combustion and including leaks of methane. They made comparisons within the five sectors they studied – power plants, furnaces, exports for electricity generation overseas, buses and cars – and across sectors to see which use of natural gas pays the greatest dividend for reducing greenhouse gas emissions. “This research is aimed at a world where natural gas has become more abundant,” Cohan said. “Some people vilify natural gas, focusing on leaks, and others make it out to be a clean, green energy source. Though focused on end uses of natural gas, the paper also shows how results are affected by highly uncertain leak rates from natural gas production and delivery. The “well-to-wire” research showed new natural-gas power plants are responsible for less than half as much greenhouse gas per kilowatt hour of electricity generated as existing coal power plants. Meanwhile, a “well-to-wheel” analysis of transportation fuel showed natural-gas-burning and gasoline-burning vehicles were nearly identical in emissions impact. Calculations were modeled on Honda Civics, which are sold in both configurations as well as a gas-electric hybrid. In the latter case, the hybrid had a 27 percent lower emissions impact than the natural-gas version, due to its better fuel economy. A comparison of natural-gas-burning versus diesel-burning buses gave the emissions edge to diesel, which accounted for 12 percent fewer emissions, within the range of uncertainty. “Natural-gas vehicles yield the least savings, and require building out infrastructure that doesn’t transition into new renewable options,” Cohan said. The researchers found replacing old oil-burning furnaces for residential heating with new natural-gas-burning models yielded emissions savings of up to 48 percent. Finally, taking a more worldly view, they estimated replacing coal-fired power plants in Japan with liquid-natural-gas plants that burn fuel imported from the United States would also be a net-plus for the environment, with a 15 percent emissions savings. Japan is the world’s leading importer of liquefied natural gas. Cohan is an associate professor of civil and environmental engineering at Rice. Sengupta is a 2015 graduate of Rice and now a Fulbright-Nehru Scholar at the Indian Institute of Technology, Kanpur.